Created a handmade branding system suitable for Texas Junk Co, inspired by secondhand products, hardware, western goods, vintage Texana items and cowboy boots. The shop is considered a Houston Gem and a must visit shop. The logo was inspired by vintage items, all is handmade and one of a kind. The copper foil stamp is perfectly imperfect on the snake, with a slight of grunge texture. The sign is handmade painted using copper paint on reclaimed wood, natural patina which has aged for over 30 years. 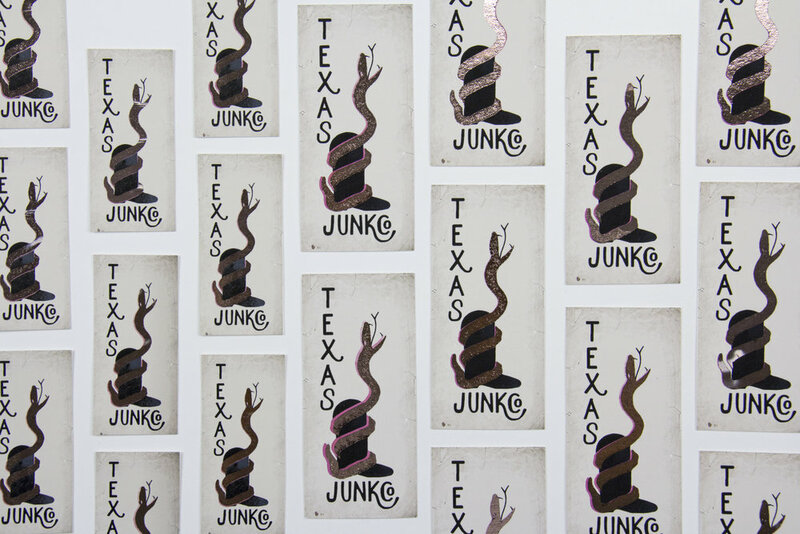 Client: Robert Novotney, Texas Junk Co.
For a brand identity, every detail matters and has a meaningful reason for usage; don't just add something to make it look "pretty." The design must be timeless, have a purpose and tell a story.